The bees could really use some help. In the last 10 years, a phenomenon called Colony Collapse Disorder (CCD) has killed off huge numbers of honeybees around the world. It's normal for beekeepers to lose 10–15 percent of their hives each winter, but beginning in 2006, beekeepers started reporting losses of 30–90 percent. Scientists believe CCD may be caused by a combination of pesticides, parasites, and a decline in wildflowers as more and more land is developed. This is where Seedles come in. Each "bomb" contains wildflower seeds packed in compost and brightly colored clay. "Planting" them is easy: You just throw them on the ground and wait for the rain, sun, and soil to do their work. 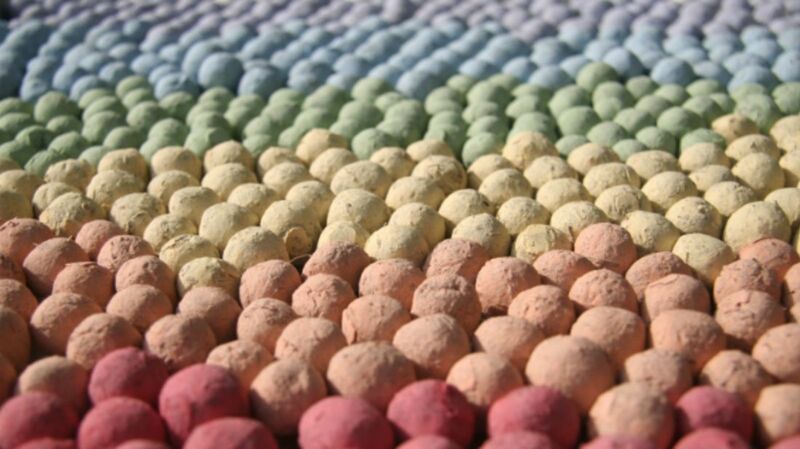 The candy-colored seed bombs "practically grow themselves," says the company's website. There are six varieties, one for each region of the country, so bee lovers can be sure to plant native flowers that will thrive in their area. Seedles are the brainchild of San Francisco's Ei Ei Khin and Chris Burley, a couple who initially hoped they could get people to plant a million flowers. They surpassed that number in 2014. In an email to mental_floss, Burley (now the company's "pollinator-in-chief") said they've since set their sights higher: a billion flowers for the bees. Khin and Burley are especially concerned about the interdependence between honeybees and our food supply. Of 100 major American crops, 70 are pollinated by bees; without them, we might not have apples, almonds, carrots, or avocados. To encourage interest and awareness in the plight of the bees, Seedles partners with local food companies to give out free seed bombs. Because they're pretty, simple, nontoxic, and foolproof, the seed bombs make great educational tools. Kids like Khin and Burley's two-year-old son, Orion, love chucking the little clay balls.